Sunday May 15, 2016 marks the beginning of National EMS Week and presents an opportunity to honor the men and women who deliver pre-hospital 9-1-1 emergency medical care throughout the United States. This vital public safety service is provided primarily by cross-trained, multi-role emergency responders who are based in our nation’s fire departments. On the evening of May 5th, all 1,500 guests gathered together in the International Ballroom of the Washington Hilton to pay tribute to our nation’s fire and emergency services. The Congressional Fire Services Institute is pleased to announce that the Honorable Tom Vilsack, U.S. Secretary of Agriculture, will deliver remarks at the 28th Annual National Fire and Emergency Services Dinner on May 5, 2016 at the Washington Hilton, in Washington, DC. The Congressional Fire Services Institute (CFSI) and Masimo will honor two fire departments for best practices and innovative solutions in the delivery of emergency medical services with the Excellence in Fire Service-Based EMS Award. The award presentation will take place on May 5th at the 28th Annual National Fire and Emergency Services Dinner in Washington, DC. The honorees are the Olathe (KS) Fire Department and Kittitas Valley (WA) Fire and Rescue. 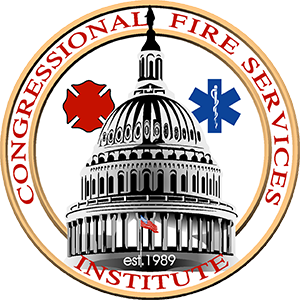 The Congressional Fire Services Institute (CFSI) has released a Legislative Outlook for the Second Session of the 114th Congress. In 2016, Congress will consider a number of issues of critical importance to the nation’s fire and emergency services. The Congressional Fire Services Institute’s Board of Directors selected Assistant Fire Chief Carl Holmes (Ret) as the recipient of the 2016 CFSI/Motorola Solutions Mason Lankford Fire Service Leadership Award. The Congressional Fire Services Institute (CFSI) is still accepting nominations for theDr. Anne W. Phillips Award for Leadership in Fire Safety Education and theExcellence in Fire Service-Based EMS Award. The Congressional Fire Services Institute (CFSI) and the National Fallen Firefighters Foundation (NFFF) have selected the Fire Department Safety Officers Association (FDSOA) as the recipient of the 2016 Senator Paul S. Sarbanes Fire Service Safety Leadership Award. There’s an adage in Washington, DC that “all politics is local.” CFSI Executive Director Bill Webb will share his thoughts on how local fire service leaders can make a difference at the national level to advance important fire service legislation in the 114th Congress. Webb has worked in Washington, DC since 1985, the past 21 years as an advocate for our nation’s fire and emergency services. On Thursday, February 25th, Congressman Richard Hanna (NY-22) and Congressman Bill Pascrell, Jr. (NJ-9) introduced H.R. 4625, the Firefighter Cancer Registry Act.